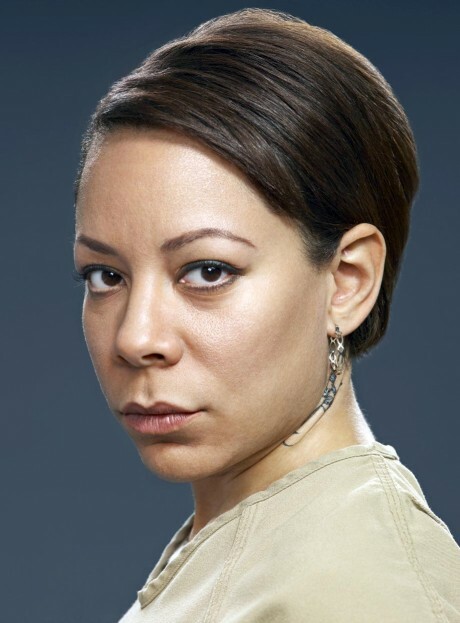 In the newest Netflix-exclusive series “Orange is the New Black,” actress Selenis Leyva plays Gloria Mendoza, one of the many inmates in a women’s federal prison in Litchfield, NY. The show centers on inmate Piper Chapman (Taylor Shilling), a Connecticut woman serving 15 months for transporting drug money for her drug-dealer girlfriend (Laura Prepon). During our interview, Leyva, 41, who is of Dominican and Cuban descent, talked about working with a cast that is predominantly female and how much she knows about Season 2, which is currently in production. What attracted you to the role of Gloria Mendoza? Well, initially I didn’t even know there was a Gloria Mendoza in the script to be honest with you. I had auditioned for another role and didn’t get that one. A couple weeks later I was called and they told me through my manger that I was offered the role of Gloria. Of course, I didn’t know what that meant, but I knew I had to be on board. I hadn’t even read the entire pilot, but I knew it was going to be really good. So, I took the role without knowing too much about the character. Is there anything specific about the women in this prison you can identify with? Well, I grew up in New York where there is such a different variety of people. That’s the beauty of this show. There is no cookie-cutter [characters]. There’s a story for everyone. I thought it was wonderful to come into this world. It’s relatable. What is the dynamic like on the set with a cast that is mostly women? (Laughs) Well, it’s interesting because I always thought a cast full of women could get a little nuts, but it’s a wonderful, sisterly environment. It’s like we’re in a college dorm or some kind of sorority house. We laugh and share stories. It’s a wonderful place of support. I’ve never experienced that. I’ve never been on a show that has been predominantly women. It’s great to show the industry it works. Women do sell. We do have power. Something I really found refreshing about the series is that it shows the women in a raw light. No one is wearing makeup. You can see everyone’s flaws. Do you think that’s important for audiences to see? (Laughs) I have to laugh because it’s really hard for us to come in with any lipstick or mascara on and then have to wipe it off. We come in with a blemish and they’re like, “We’re going to highlight that blemish!” I think there is something very vulnerable about that. But it’s the real world. We’re not trying to make it pretty. If we’re going to do a show about women who are incarcerated, we’re not going to sugarcoat it. As actors, it’s a very vulnerable place to go. But for the audience, these imperfections are welcoming and refreshing. Netflix has had some success with its exclusive shows like “House of Cards” and “Arrested Development” and now “Orange is the New Black.” Do you think releasing TV series in this format has staying power? I think so. I think back to what HBO did a few years ago when they shook it up for mainstream television. I think Netflix is introducing a new way of showcasing talent and putting out programs. [“Orange is the New Black”] is always going to be part of that. People will look back at this time and think, “Netflix changed television.” I think it’s brilliant what they’ve done. It works for people. It works for the busy mother or someone who works all the time that doesn’t have time to go home and worry about setting the DVR. You can watch this show at your leisure. You have control. That’s what it’s about nowadays. Are you the kind of Netflix viewer that is going to watch a show like this in one sitting or will you watch an entire season little by little? Well, I watched “House of Cards” in three days – and only in three days because I had other responsibilities like my daughter. I couldn’t just sit there and watch the entire season in just one sitting. It took me two days with “Orange is the New Black.” But having more control now is great. It gets people more involved. How do you think you would fare in the prison system yourself? Would you go in with your head down and keep to yourself or do you think you’d want to make sure everyone knew who you were by fighting the toughest woman on the cell block? (Laughs) If I had to go in [to prison], I’d have to go in as the baddest woman in the system. I would have to let [the other prisoners] known not to mess with me. I would put a show on. It would be my Oscar performance. I think the toughest survive. You have to link up to the strongest and make sure you’re friends with them. I would have to play the game if I wanted to survive. What would you miss the most about the outside world? I couldn’t even imagine not being able to take long, hot showers or wear makeup whenever I wanted or shave my underarms. There are certain things people take for granted. I appreciate freedom now even more. How far are you into shooting the second season? We are just wrapping up the third episode of the season. We don’t know much. Like the first season, they’re keeping everything very hush-hush. It’s kind of like Christmas when we get a new script every other weekend. The writers are doing a great job of keeping everything fresh. It’s absolutely amazing. I’ve never been in such awe of writers before. I don’t want to know what’s going to happen to be honest with you. I like Christmas! Give me a gift every other weekend and I’m good. In the first season we saw some flashbacks that give the audience a backstory for certain characters. Do you hope we get to see that for Gloria in Season 2? I think it would be great for every actor on the show. Who doesn’t want more screen time? But just being a part of this groundbreaking show is so amazing. If I get a backstory, wonderful. If I don’t, that’s OK, too. Whatever they give me, I will take happily because my life has been changed in the best way by this show. Do you have a backstory in your head you’ve been using on your own to get into your character? You know, when I came into this I had to be like, “OK, I’m going to be a clean slate.” As an actress, there are thinks you have to create in your mind, but even recently the writers told me something they were thinking and I was like, “How interesting because I was thinking the exact opposite.” So, we’re really creating as we go. But our writer’s really listen to us. They want our input. They ask us questions. They’re open to our suggestions and creating as a team. 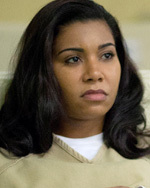 Polanco plays Dayanara Diaz, an inmate who becomes romantically involved with prison guard John Bennett. Dayanara’s character is criticized by other Latinas because she can’t speak Spanish. 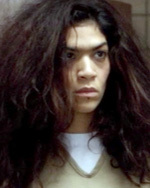 Rodriguez plays inmate Aleida Diaz, Dayanara’s mother who isn’t much of a role model. She is cruel to Dayanara, but later helps her with the guard situation. Pimentel plays Maria Ruiz, a pregnant inmate and the Latina crew’s representative for the prison’s advisory council. 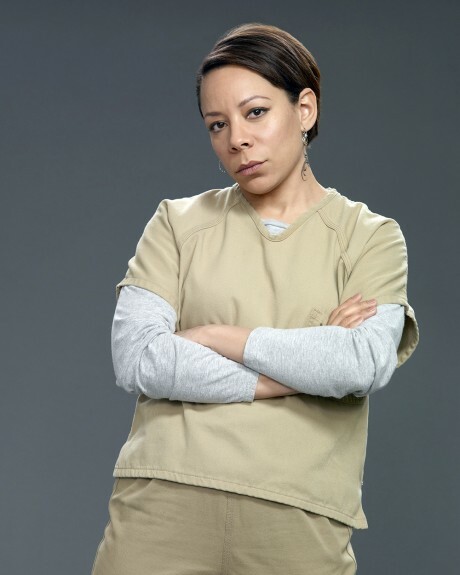 Cruz plays Marisol “Flaca” Gonzalez, an outspoken inmate in the Latina crew. Guerrero plays Maritza Ramos, a Latina inmate and best friends with Flaca. Gomez plays Blanca Flores, an insane inmate who has smuggled a cell phone into the prison. Actress Amanda M. Rodriguez plays Inmate Rodriguez, a prisoner we see working in the electric shop. Actress Tamara Torres plays a character known as Weeping Woman, an inmate we see always crying when talking on the prison phone.